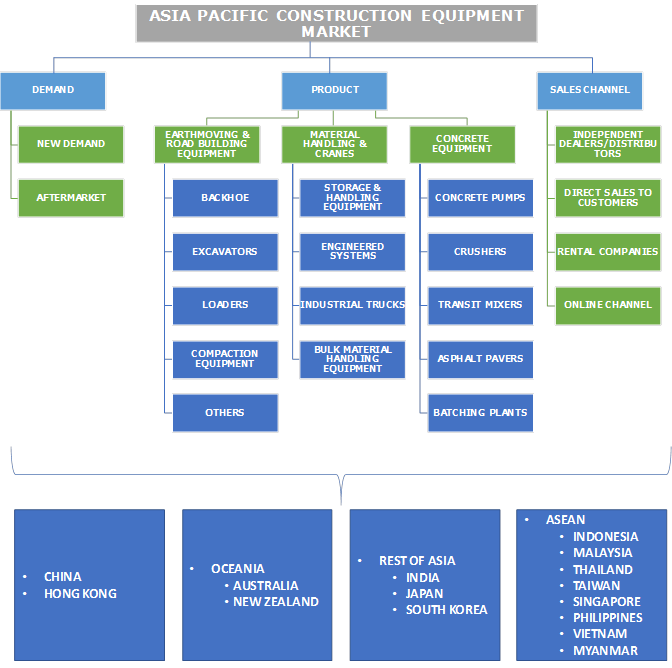 Asia Pacific Construction Equipment Market size was valued at over USD 55 billion in 2018 and will grow at a CAGR of 5% from 2019 to 2025. The shipments are expected to reach over 500 thousand units by 2025. The Asia Pacific construction equipment market is growing rapidly owing to several construction & infrastructure transformation activities in the developing countries including China, India, and Indonesia. The building sector is experiencing government & private investments as a part of the national development and urbanization strategies. The public facility enhancement projects for improving the rural areas in various Asian countries is a major driver for the market. Moreover, economic stability and increasing income of several countries including Nepal, Sri Lanka, and Bangladesh in the recent years support the development of roads, irrigation systems, airports, and hydropower plants, further adding up to the machinery consumption. A major factor hindering the Asia Pacific construction equipment market is the unavailability of skilled workforce and operators in several countries including Nepal and Bangladesh. To overcome the issues and increase the industry presence, manufacturers are providing certified training course & programs for the customers. These strategies also improvise the customer experience and eliminate future accident cases on a large scale. Another reason for limited machinery sales is the high initial price involved in procuring new machinery, further restricting the industry development. In APAC construction equipment market, the rising demand for new machinery has been witnessed owing to the requirement from a rental provider who further supplies to the end-users at lower prices. Owing to the high initial investments in buying new machinery, customers are increasingly opting for rental machinery, driving the sales of new machinery in the Asia Pacific construction equipment market. Moreover, sufficient government and private investments in complex infrastructure projects compel the contractors and other government facilities to procure new machinery to facilitate efficient work operations and operator safety. The Asia Pacific construction equipment aftermarket is witnessing growth and will grow at a CAGR of 8% from 2019 to 2025 due to the technical improvements by major manufacturers. These include fuel-efficient and low carbon-emitting systems that support environmental conservation initiatives and fulfill various regulations. In the construction industry, regional governments have set several standards for machinery utilization including pollution levels and operator safety. As a result, the manufacturers are developing legally-compliant replacement parts & components, further supporting the Asia Pacific construction equipment market development. For instance, ZF provides highly efficient driveline technology for the construction machinery & material handling equipment in its aftermarket solutions portfolio. 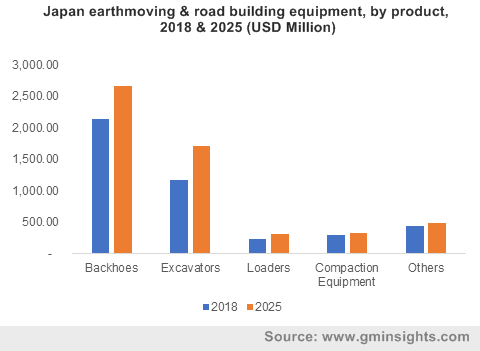 Increasing adoption of the earthmoving machinery, such as excavators and loaders, in the traditional building applications owing to advantages over manual labor is fueling the APAC construction equipment market. These machineries provide several benefits such as quality improvement, increased project efficiency, and cost savings. By utilizing the modern machinery, end-users are experiencing an increase in profitability as they provide high productivity over labors, thereby increasing demand in the Asia Pacific construction equipment market. Moreover, building sites with several high-risk operations are implementing these machineries to strengthen the safety parameters and reduce the time required in conventional operations. Contractors using the machinery have a better safety & accident track records, which improve the profitability as the companies eliminate labor accident compensation, further attributing to the rise of industry size. The material handling machinery usage in Asia will grow due to the rise in industrialization with industries demanding technologically-advanced material handling solutions. Additionally, various government plans & investments to enhance the energy & utility sectors for increased foreign trade income is driving the construction equipment market demand in Asia Pacific. For instance, the adoption of ‘Hub of the Indian Ocean’ plan in Sri Lanka is driving the shipping and logistics sector. The adoption of Vision 2025 plan in Sri Lanka, which includes the expansion of port infrastructure, development of trade facilities, and improvising the business environment is increasing the sales. 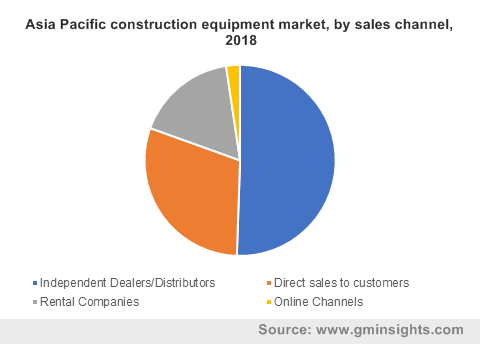 In the Asia Pacific construction equipment market, direct sales channels for the sale of equipment & replacement parts are steadily growing among the larger countries including China, Japan, and India due to the establishment of direct sales facilities by leading manufacturers. The global players are emerging in the smaller ASEAN countries through their distributors and direct sales channels to cover a larger market share. For instance, in September 2017, Crown Equipment announced the launch of its new branch in South Korea as a part of its expansion strategy in Asia. The company also established its facilities in Thailand, Malaysia, and Shanghai. Independent dealers and distributors cover a major share in the Asia Pacific construction equipment market owing to manufacturers’ wide distribution network across Asia Pacific. To strengthen their presence in Asian countries, several manufacturing companies have established dealership facilities that provide the machinery to local customers. These facilities also provide replacement parts and aftermarket services such as the installation & repair of machinery parts. Manufacturers have set up their warehouses and delivery locations in every region to address customer requirements in the shortest possible time. Such strategies and increasing expansion to untapped regions are fueling the APAC construction equipment market development. In the Asia Pacific construction equipment market, India is expected to grow at a CAGR of over 9% from 2019 to 2025 due to high infrastructure investments for developing highways, railways, and other public infrastructures. According to IBEF, the number of construction machine sales in India from April 2017 to March 2018 was 97,000 units. Moreover, the focus of the Government of India on enhancing public facilities and providing the citizens with efficient roadways & highways throughout the country will support the industry growth. Prominent players operating in the Asia Pacific construction equipment market are Caterpillar, Inc., Doosan Group, Hitachi Construction Machinery, J.C. Bamford Excavators Limited, John Deere, Kobelco Construction Machinery, Liebherr, Komatsu Ltd., Sany Group, Terex Corporation, and Tadano Ltd. The companies are focused on developing technically-equipped environment-friendly features. All the major players are increasingly adopting strategies for expansion in Asian countries through sales & distribution channels. To pose more competitiveness in the APAC construction equipment market, companies have established after-sales services and training centers to support customers and operators for efficient machinery usage. The construction equipment market in Asia Pacific is highly competitive owing to the presence of several leading players in Asian countries and their rapid business network development strategies. Several leading players are collaborating with the global and local players to develop new machinery and cover a major market share. The industry is witnessing the establishment of online sales channels owing to the demand from various countries where the physical distribution facilities have less presence. The companies also achieve new customers through these channels, further contributing towards achieving high industry share.